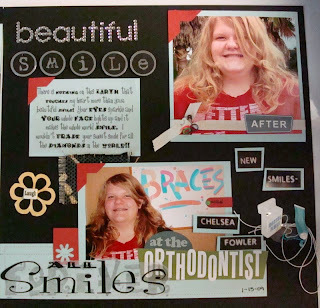 This double page layout is an example of using what you have on hand! I placed pieces of fabric scraps behind 2 of the photos to add texture and interest. My color combo of basic black and soft sky textured cardstock is complimented by reds, and greens. I had many of these items in my sticker and embelishment stash and just looked for items that would work with the theme. I did search hi &low for embelishments that had to do with braces, in the end I found 2 sticker pages at Michaels. It came out great and Im sure she will be happy (someday) to look back at those metal mouth days, I figured if I spend 7,000 on something Im scrapin' it darnit!! 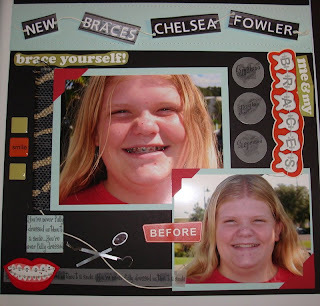 Sigh, I remember those days of braces! At least I didn't have to have them twice, like my Dh did! Fantastic pages!